The persistence of those political leaders brought tangible rewards. Almost 1,500 people died in Northern Ireland’s “Troubles” during the 20 years before the agreement (also known as the Belfast Agreement), compared to fewer than 150 victims of conflict-related violence since, according to the BBC. Power-sharing arrangements at the legislature in Stormont in Belfast — one of the central pillars of the agreement — have broken down amid disputes over how to deal with the legacy of the “Troubles” and a disagreement over Irish language rights. That has left Northern Ireland without a functioning executive since January 2017. 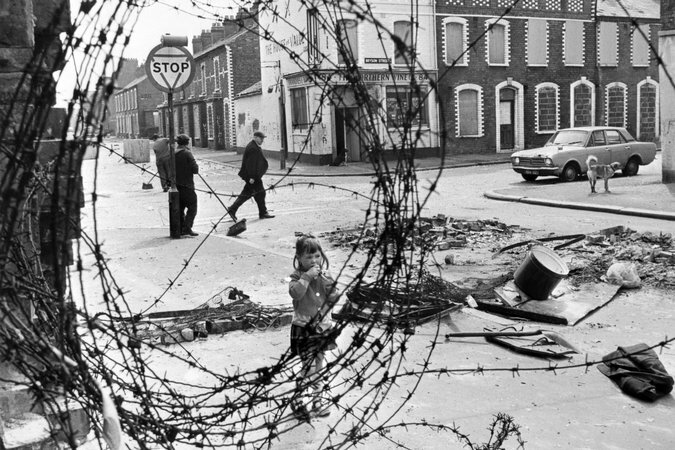 A roadblock in the Catholic area of Belfast in 1974. “The moderate parties of course will be the ones who are advocating this,” he added. Mr. Blair also outlined his fears about the impact of British withdrawal from the European Union, or Brexit, a process he still believes can be halted. Brexit creates special problems for Northern Ireland which, as part of the United Kingdom, is to quit the European Union, while Ireland will remain a member of the bloc. Meanwhile, some supporters of Brexit in Britain have questioned the long-term future of the Good Friday Agreement. Under the Northern Ireland peace process, visible signs of the Irish border disappeared, and the British government is struggling to explain how it can quit the European Union’s economic structures without the reimposition of frontier checks. “I’m not saying these issues can’t be overcome, but plainly Brexit poses a challenge,” he said, adding that it fundamentally affects a concept at the heart of the Good Friday Agreement. While ways might be found for the frontier problem to be minimized, “you are not going to make it disappear,’’ he said. “I don’t think there is a way apart from staying in the single market and customs union.” Prime Minister Theresa May of Britain has promised to quit both those structures, which bind the European Union into a single trading bloc. Mr. Blair also appealed for Britons to be given a chance to vote in a new referendum on the terms of the Brexit deal Mrs. May hopes to finalize in the fall. “One of the reasons why it’s so sensible that the British people are given a vote on the deal the government comes up with is that it really is absurd to say our knowledge of the situation is not hugely more advanced today than it was in June 2016,” when Britons voted to leave the European Union, he said. Asked about recent speculation about the possible creation of a new centrist party in Britain, Mr. Blair — under whose leadership the Labour Party dominated that space — said that, among British lawmakers, the focus was on Brexit and there was no appetite for a political realignment. “But there is obviously a large middle ground that is not represented at the present time,” he added.